FBC Jax Watchdogs: Perry Noble and NewSpring Kick-Off the Tithing Season with Parody of Themselves!! I really feel sorry for the folks in the mega churches who are subject to this Biblical untruth and manipulation. Many of the pastors you have written about are SBC church pastors. Their churches are probably not giving much to the CP or the missions offerings. They seem to have the feeling (arrogance) they can do so much better with the church's money. How sad that churches have resorted to such demonic theology to keep the money just rollin' in so the pastors can live the high, "good life." I wonder if the staff of the church gets the kind of money the pastor gets. I doubt it. There are a lot of Christians in this era who either are brainwashed to believe whatever the pastor, big church or little church, says, or they are just plain stupid to believe the "man of gawd." Maybe the doughnut-man preacher will be visiting that church soon. I go to a large SBC that thankfully doesn't do any of the kinds of things mentioned on this website. Nevertheless, many friends in my church speak so much stuff about TV "prosperity" preachers while filling their Facebook walls with quotes from the likes of Noble, Furtik, Driscoll, etc. They are basically doing the same thing in albeit a more subtle manner. That video is the most real thing I've seen in a long time. They may have meant it as a parody, but they nailed it. Well, maybe not the x-ray vision contact lens (only because it doesn't exist), but even without that you can bet they size up potential giving units. Probably throw money around like confetti occasionally, too. Or at least want to. I've listened to, and watched for over 35 yrs. the damage this kind of demonic teaching has done to the most vulnerable of the children of God; the poor, elderly, and disabled. Those who they target the most. I long to see the day when the Lord Jesus will finally say "enough", and put a stop to this preaching from hell. If a person in the pew is giving their money with a pure heart to the Lord through the church and like what the church is offering them in ministry, discipleship, opportunity to serve or observe what is really the big deal. If a church member is fine with the pastor making big bucks and continue to give to support that, is it really a big deal? If a church member was raised on tithing as taught by many of those mega church pastors in the preceding decades, were those men evil? If a church member doesn't care about the transparency of the finances (maybe because they have sen to many fights in the church over such things) but have decided to trust the Lord for the end result, is that such a big deal? Not everyone who teaches tithing is evil. Not everyone who gives their tithe because the see it as biblical are evil. Not every big church who keeps the topic of money coming in before the people is evil. Not every pastor making big bucks is evil. Not every pastor who makes a parody video is evil. Maybe it is fun to look for evil under every rock we don't like. Hey, September 18, 2014 at 3:00 AM. What is your point. No one here has ever claimed that "every pastor that..." does so and so is evil. The issue is quite simple. The ones that do are either liars and manipulators that use their position to increase revenue by teaching a lie...OR they are sincere and really believe this, which means they are willfully ignorant and negligent in their duties. The biggest problem, from a practical standpoint is, that the younger generation is leaving the church in droves because they can see that it is a revenue based business. These young people choose to serve elsewhere and give elsewhere where they can truly make a difference in the world and help others. It used to be learning about Jesus in a church was a catalyst for this. Now the opposite is true. Learning about Jesus merely tends to encourage them to give and serve at or through the local Christian social club. Which is very, very expensive if you do what you are told. And for what? The poor and needy still must turn to and rely on government assistance, not the church. That is why it is a big deal. And those like you that don't get it and don't seem concerned just because "not everyone is evil" are enabling them. True and no one here has said that “everyone” who teaches tithing is “evil.” What we have tried to say is that they are mistaken and a right and proper study of scripture will lead to a simple conclusion, Christians are under no compulsion or directive to give ten percent. Christians have two directives from scripture; give as God leads and to do so cheerfully because God loves a cheerful giver. Again we agree. Christians are under no compulsion or directive from scripture to give ten percent. Christians have two directives; give as God leads and to do so cheerfully because God loves a cheerful giver. Well on this I have to disagree because 1 Timothy 6:10: For the love of money is a root of all kinds of evil. Some people, eager for money, have wandered from the faith and pierced themselves with many griefs. Don’t know. Sarcasm and cynicism are indicative of an angry person. Do you really want an angry person as your pastor? A man called to be pastor chooses to live life as a shepherd not a king. A shepherd must live in the same field as his flock. He cannot live in a palace. He has to be with the flock he cannot live behind high walls and take care of his flock. Over the centuries the church has raised and taught members devotion to the king as God’s representative on earth, you must be a member of the Holy Roman Catholic church to be a true member of the church, the Pope is infallible, not to mention teaching on slavery, wife beating, persecution of the Jews and on and on. So you decide. Were they wrong? Were they “evil”? Well I guess “if a church member doesn’t care” is a perfect descriptor. My personal opinion is that the church should lead the world when it comes to financial accountability and transparency. Instead most churches lag far behind worldly not-for-profits with regard to accountability. I cannot remember but I believe there is a scripture that some kind soul will tell me about a Christian living in such a way the world cannot accuse them of wrong doing. Alethia - PLEASE send me a private email so we may correspond! Thanks!! * Interesting that you left out the the part about giving to the Lord with a pure heart. That term which was used to designate the motive. - 1: A man called to be pastor chooses to live life as a shepherd not a king. 2: A shepherd must live in the same field as his flock. 3: He cannot live in a palace. 4: He has to be with the flock he cannot live behind high walls and take care of his flock. * 1 - I am not sure you can find biblical support for this. You can interpret things to make it say this to you but I am not sure that wold be the only interpretation. 2 - But what if the sheep live in many different fields? 3 - Who gets to define what a palace is? 4 - What if some of the flock, widely distributed to many fields, live behind those walls? - Over the centuries the church has raised and taught members devotion to the king as God’s representative on earth, you must be a member of the Holy Roman Catholic church to be a true member of the church, the Pope is infallible, not to mention teaching on slavery, wife beating, persecution of the Jews and on and on. So you decide. Were they wrong? Were they “evil”? * I don't think bringing up ancient history and trying to make it a case against current pastors who live in a way you disagree with makes sense. Can you name me one modern pastor who is teaching on slavery? Wife beating? Persecution of the Jews? on and on? - Well I guess “if a church member doesn’t care” is a perfect descriptor. My personal opinion is that the church should lead the world when it comes to financial accountability and transparency. Instead most churches lag far behind worldly not-for-profits with regard to accountability. I cannot remember but I believe there is a scripture that some kind soul will tell me about a Christian living in such a way the world cannot accuse them of wrong doing. * Again you leave out the crucial factor of the comment. They choose to trust the Lord. Context is important, or should be. 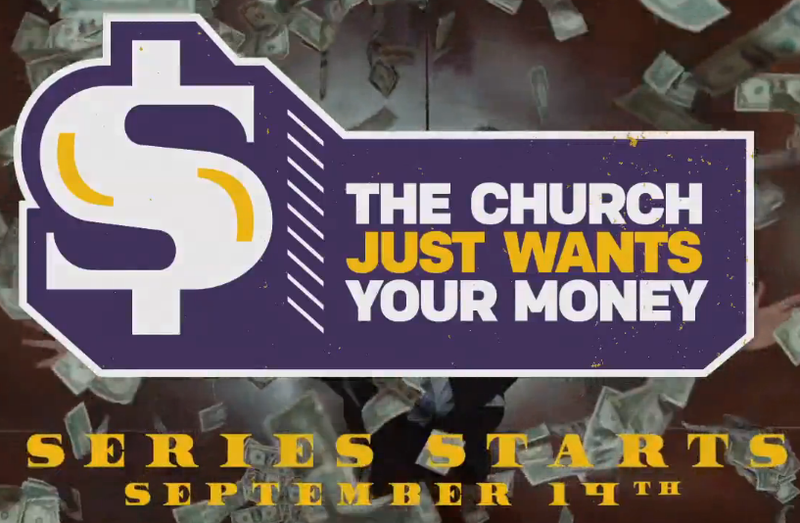 Looks like after all these years one tradition remains constant in Anybody's Baptist Church in Sept/Oct ----- Money. How do you interpret the above? Then he is a trespasser on another shepherd’s flock. He needs to stay in his own field. Since I have heard all of this preached within my lifetime, this is not so ancient history and yes I can. - How do you interpret the above? * I see a Shepherd King telling His followers how to live their lives like He has demonstrated. The teaching is not about economically living like a shepherd. - Then he is a trespasser on another shepherd’s flock. He needs to stay in his own field. * I think you missed the big picture. Big and small churches have people living all over the city. The field of the church is no longer centralized to a specific location. It is possible some sheep live behind the gates where the shepherd lives. Since palace was not my term, I will let the person who chose it to give that answer. Or, how would you define it? * I do not think so. Your response is avoiding the reality that in today's society the sheep in a church live in many places within the city. If you want to make this comment about where the pastor lives vs sheep in a field, then geographical location must be brought into the discussion. - Since I have heard all of this preached within my lifetime, this is not so ancient history and yes I can. * In context of your comment you mentioned centuries and the Pope, neither of which are current to Baptist life. I have no idea why you wanted to compare the historical narrative of the RCC to modern day baptist churches. Your point is lost. * I would imagine you have had a pure heart in making decisions to live and behave righteously for Christ. Since he comment on pure heart was about making a certain decision on tithing, I think it would be safe to say many people have given unto the Lord with a pure heart. It can be done Psalm 51:10, Matthew 5:8. In the Matthew passage we must agree that this can be done because Christ said there are those among us who have or can have a pure heart. I think it could be said, we have sat in the pews with those saints who have a pure heart. I just read Noble's blog on the sermon series. What I find interesting is what he compares church to. He basically compares church to a college football game, a concert, Starbucks, Apple, Target, and American Girl. All of these are business ventures. I'm sure that Noble wants his sheep to be as wild as a college football game. He's already shown that his "worship" efforts are like a concert. And he runs his church like many modern pastors do - as a business. He's the CEO and he has to create a brand so that he can sell his product (Jesus). If the product doesn't sell, he changes it to fit what his consumers (seekers) want so that they'll buy it. This means that his "sermons" are basically 30 minute infomercials for his version of Jesus/Christianity. Interesting reply to my asking you to name one person with a pure heart and you could not do it. Instead there is some vague argument about people and pews and tithing. Please understand I really am not trying to mock or make fun of you but your answer is all too typical of us. Because, my friend, the one person with a pure heart is Jesus. There is no one else. But like so much in the modern church with our I-mags, wifi, rock bands, coffee shops, etc., Jesus is missing. And before you saying anything, I am guilty, too. I named you. I referenced scripture where Jesus supports and speaks to the fact that there are those among who have a pure heart. Sure I could mention names but you would not know any of them.That snot the issue. The fact is - Jesus says those with a pure heart are blessed. If that is something that cannot be obtained, why did Jesus speak of it? Do we get to pick and choose which of the beatitudes are capable of being lived out? If I write here with the foundation that my heart is wicked, that is what you will get. If I write here with full intentions to use words which honor God, is that not doing what I do with a pure heart? Is not a pure heart, at least to some extent, about the motive behind what we do? If this is something that is not achievable then we are all just wasting time trying to correct others when we, by your admission, cannot have a pure heart in that which we do. Are we just one dirty rag telling another dirty rag they are dirty? Uh, nobody has a pure heart, as you're demonstrating by your attempts to defend Noble, his false teaching, and his celebration of himself. Sorry, I am not defending Noble. I mentioned those who give with a pure heart. That has escalated to this point. In the beatitudes was Jesus giving false hope, speaking of the unattainable (Matthew 5:8)? Will those who lack a pure heart, not see God? The position that no one but Christ has a pure heart doesn't argue against my point but Christs. Psalm 24:3-6 tells us the conditions of a pure heart. "Do we get to pick and choose which of the beatitudes are capable of being lived out?" No - you can't live out any of them. That's why we need a savior. As this year is the Shemitah, it will be interesting to see if the issue of tithing is dropped from the pulpits. OK this story has run it's course. Next! What is ol Ergun up to? Gee, here it is, 26 days after the last comment from the latest entry from WD...and nothing new to report on. On the one hand, I truly do hope nothing is physically wrong with you, Mr. Rich, but if there is, I hope you get better. However, if your silence is due to nothing of interest or importance going on in the "wretched" mega-churches, no new "scandalous" musings or activity, then maybe the silence is a good thing that should teach us all to guard our tongues and put up barriers to prideful, hurtful criticisms (even if we're RIGHT!) that only damage one another and, more importantly, gives the world opportunity to make mockery of our Lord. Just something to consider, Tom. Thanks for checking in, "friend". I'm doing very well, thanks. Just not a lot to write about. You can be sure I'll continue to write as long as I care about the state of modern Christianity. If I don't care, I'll stop writing. And no, this blog does not give the world an opportunity to make a mockery of our Lord - rather it is the pastors and the topics on which I write that have already done that, and that is why I blog. ..." this blog does not give the world an opportunity to make a mockery of our Lord - rather it is the pastors and the topics on which I write that have already done that, and that is why I blog." Really, Mr. Rich? How can you deny your role in bringing to light (to ANYONE in cyberspace) these stories you choose to comment on? Are you that naive to think that it is only Christians who read your blog? The whole world is FULL of people, lost people, just looking for opportunities to trash the people of God and YOU, sir, help them along by giving them a forum in which to do that. I cannot believe that you do not see that as you are just as culpable as the pastors who "screw up" because you "put it out there" on the internet. You may write about some pastor/leader in Georgia but someone who lives in Utah or Ontario or New Delhi will read it and then use it to trash Christianity and the name of God as well as the work that some missionary might be doing in those parts of the world. And you honestly believe that your hands are clean of this? God help you, man! -- "Do we get to pick and choose which of the beatitudes are capable of being lived out?" **Why would you say this? I mentioned one because it dealt directly with the subject at hand. -- No - you can't live out any of them. That's why we need a savior. ** When did I take Jesus out of the equation. I was speaking of believers, as I thought that was the idea of those who would have a pure heart. You are reaching to make a point that has already been made. As a believer, I can have a pure heart. As one who loved God, David asked for a pure heart. Not because it was unobtainable but because it was. Your turn. If you need to throw a gotcha out there because I did not state directly that I was referring to believers who could possess a pure heart, then have at it. If you need to win the conversation, I'll let you have it. My heart is fine and my conscience is clear. When the sheep are being led into false and dangerous situations, a good Shepherd/pastor/Christian will protect and warn them by exposing the danger. "My heart is fine and my conscience is clear." Self-righteous statements like this show a person who is far from God. When the prophet Isaiah saw a glimpse of the holiness of God, he came apart at the seams. The New Covenant is written on the heart and we become new creatures. That old deceitful heart does not apply to the new creature. Even Jesus said those with a pure heart are blessed. He is testifying to the sacrifice of Jesus on our behalf. You are lined up with the Word in your comment. Well stated. Indeed, what must they think? Well, my experience is that they pretty much think that we are no different than any other cult or religion, especially when we shun those brothers and sisters who disagree with our point of view. However, it is when we set aside our differences in love and worship the true and living God, Lord Jesus that we demonstrate the hope that lives in us. There will always be differences, that’s a given. How often do you have differences with your spouse? Does that mean you are not married or that you don’t love each other? How does the world know that we are believers? Is it because we march in lock step with each other blindly following behind some leader? “By this everyone will know that you are my disciples, if you love one another." Indeed, what must the lost think when we support men who live fabulously affluent lifestyles while extorting money from people by threatening them with the wrath of a Holy God if they do not pay the appropriate amount of tribute? How does it make the one true God any different from the gods of this world? What's even more amusing is that one of the pastors at Church(Circus) of the Glades plagiarized Noble's tithing sermon. Listen to yesterday's Fighting for the Faith. Could we get a little clean up help at Brewton Parker in the area of the baseball field and East of the soccer field. We had a guest team in from Glen County for a scrimmage game. Trash was poring from the dumpsters. The grass needs cutting East of the soccer field. The trash scattered around the grounds in that area would make a nicer presentation if it was removed.